In our country, development of an individual as a good engineer is considered as the lifelong venture, as they have created the world we are living. Or in other words, they are responsible for creating our standard of living. So, it has become a prime authority to develop a good deal of excellence for industrial ages of mechanization, electrification, and digitalization. 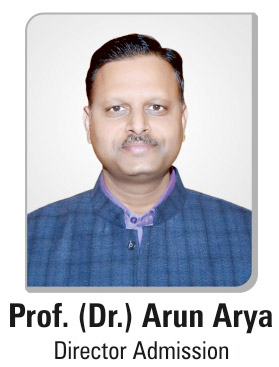 With this point of view, Arya College of Engineering and IT has organized a motivational lecture on 25th January which was initiated and managed by by Prof. Satish Batra for B.Tech 1st year students. He was the speaker or guide of the event which motivated and inspired the students for various strategies, stories and his own experience through his words. In the discussion, he suggested three-step strategy required for meaningful success and happiness for an individual. A person should always follow his inner insights, regardless what comes in between their path. Today’s engineers are powerful and multi-tasker. They can do more than what they are asked for. This learning will help the students or the listeners in their near future that can make their academic or professional life even more stronger and successful. But the budding as well as professional engineers are facing numerous concurrent challenges that include strengthening of the engineering educational systems, attracting and retaining a broader cross-section for our youth. Therefore, they are required to build a solid foundation based on strong fundamental, technical deep focus, good range of expertise, simulation expertise or continuous learning, as it can change the vision or the perspective to take things differently or inn a unique from form the other people sitting across the globe. Engineering also has an enhanced focus on innovation, entrepreneurship and job creation. So, it has become necessary to apply and execute those strategies and forms that can help and develop certain amount of growth for the individual, society and the country. Students are providing technological world with diverse activities that covers many different areas, levels and excellence. This sector is regarded differently in different countries and at different times. This diversity, the constraints of size and the resources available to produce future innovations may result in a decline in growth of the world economies if solutions to engineering’s declining popularity with young graduates is not addressed. The scientific, technological and innovative activity helps to connect with each other through the involvement and dedication of the person.